Biological pollution presents a distinct threat to the environment. Just as chemicals may contaminate the air, water, or soil, invasive plants and animals can overwhelm an ecosystem. Whether they come from distant habitats or biotechnology labs, non-native invaders may out-compete native species and diminish biodiversity. Invasive species are nothing new. The pernicious kudzu plant, for example, was imported from Japan in the early 20th century and has overgrown much of the southern U.S. landscape. However, increased international trade in recent decades has opened new avenues for people to intentionally or unintentionally transport organisms to non-native ecosystems. Once established, invasive species may compete with native plants and animals for food, habitat, or other resources. In particularly fragile systems, the invaders may drive the native species toward extinction. New technologies have brought additional biopollution threats. Genetically engineered (GE) crops have introduced new genetic traits never before found in nature. Plants engineered to survive herbicide applications have cross-pollinated with weedy relatives to create “super weeds.” Some insect pests are becoming resistant to the natural pesticide produced by bt-cotton, -corn, and -soybean plants. Biopollution from GE plants has contaminated non-GE and even organic crops. In the short-term this may pose threats to the environment or human health. In the most publicized contamination incident so far, the StarLink variety of corn, which has not been approved for human consumption, made its way into our food supply. Over the long term, GE pollution threatens biodiversity. 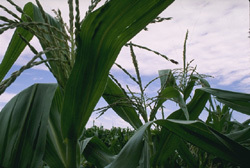 Authorities in Mexico, for example, fear that GE corn may cross-pollinate with native corn varieties unique to the region. Biopollution from genetically engineered organisms is particularly dangerous because it exists on the genetic scale, making it nearly impossible to control or clean up. CTA and its sister organization, The Center for Food Safety, seek to educate policymakers and the public on the dangers of biopollution and invasive species and to encourage stronger policies to prevent their spread.